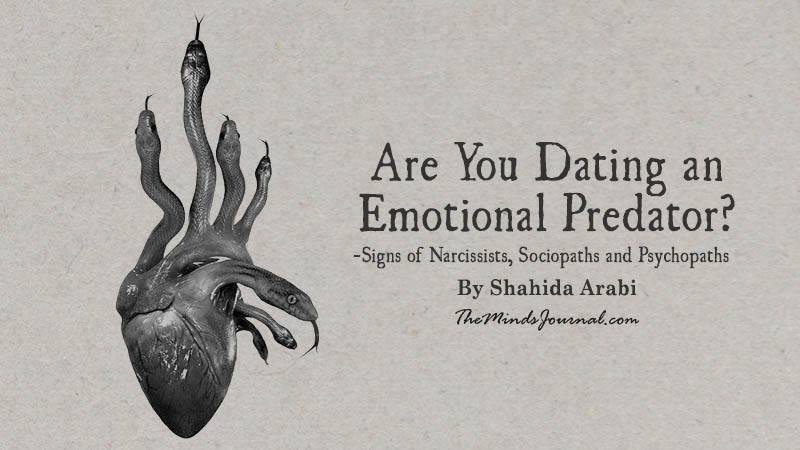 Dating an emotional predator such as a narcissist, a sociopath or psychopath is a devastating emotional roller coaster of highs and lows. Although many abusers tend to unfold and reveal their true selves long after they’ve already reeled their victims in, there are some key signs to look out for when dating someone that can foreshadow their future behavior. It’s important to note that emotional predators are not those who act out of their pain occasionally; these are toxic people who intentionally and consciously hunt down victims and targets to fulfill their agenda. They have a chronic pattern of manipulation, deceit combined with a lack of empathy and remorse for their actions. What many people fail to understand is that this type of behavior is intentional, sadistic and often premeditated. If these predators have Narcissistic Personality Disorder or Antisocial Personality Disorder, their lack of empathy is intrinsic to their disorder. The National Domestic Violence Hotline dispels the myth that an abuser’s mental illness, however, causes the abuse – because abusers do not abuse everyone – they usually choose to abuse their nearest and dearest. In these cases, abuse is caused more so by a choice by an abuser rather than their mental illness. These individuals can “switch” their mask quickly when in the public eye. That means their abuse is under their conscious control and the abuser is still accountable for continuing to abuse others and not seeking treatment. The predatory nature of these types of individuals has actually been well-documented and researched by experts such as Dr. Robert Hare, Lundy Bancroft, Dr. Martha Stout, therapist Christine Canon de Louisville and Dr. George Simon, many of whom have worked with these abusers and their victims as clients. All found that the abuse was deliberate and so was the manipulation. In fact, these researchers and advocates discovered that many abusers enjoyed and gained a sense of fulfillment out of manipulating others for their own gain. These provocative comments might be disguised as constructive criticism or “just jokes,” but you can distinguish them because they are often comments laced with condescension rather than compassion and consideration. Harsh teasing that serves no other purpose but to ignite your anger or annoyance, put you down and insult you is different from playful teasing which is used to flirt and build rapport with a partner.